Mobile phone users could soon face bills of up to €10 for sending a simple Facebook message as low data allowances hit consumers. New figures from Ireland's telecoms regulator show that the average Irish person is now using almost twice as much monthly data as last year. Comreg says that Ireland's 3.6 million smartphone users are piling on an average of 1.8GB of monthly data each as they tweet, message and share photos on social media. Many operators punish heavy internet use on Irish smartphones with hefty charges. Once you exceed the data allowance agreed in your package, some operators are charging up to €1 per megabyte for data used. This means that uploading a Facebook message or checking a photo could cost €10 for those caught over their limits. Many phone plans from Irish mobile operators offer between 0.1GB and 1GB per month, far below the average usage rate. And some mobile operators continue to insist that using more data is for "advanced" users. However, the latest statistics from research firm Ipsos MRBI indicate that around half of all Irish adults now use Facebook on a phone, with a majority using it every day. Other popular activities, such as email, instant messaging and YouTube, are also now used by a majority of Irish people. And recent figures from Dublin-based Statcounter showed that Irish people now rely on phones for internet usage more than any country in the western world. By comparison, text-message activity continues to slump in Ireland, with the number of SMS messages down by almost 50pc over the last three years. 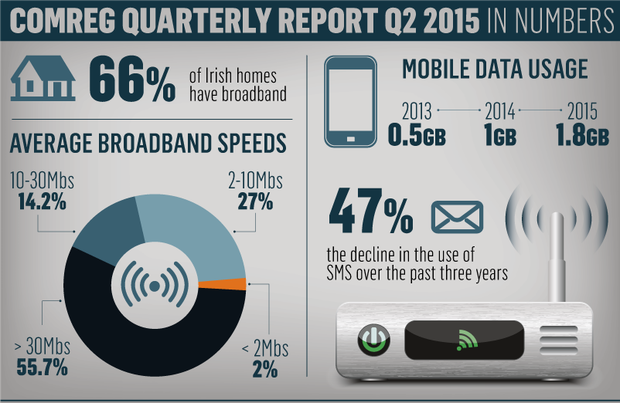 The Comreg figures show that there are 3.6 million users of 3G and 4G phones in Ireland. Mobile data usage looks set to keep rocketing in Ireland as people continue to ditch smaller phones for larger, internet- optimised devices. Industry figures show that Ireland will soon have a majority of bill-pay customers, as this is seen as a more affordable way to get hold of high-performance smartphones, such as the newly launched iPhone 6S or Samsung S6 Edge Plus. And Comreg also says that there has been a surge in mobile high-speed data coverage around the country, with 27pc more 3G subscribers than the same time last year. Vodafone says that over 90pc of the population is now covered by its 4G services, with the coverage extending from urban areas into rural areas, including the border counties and isolated parts of rural Connacht. A recent survey by the Irish Independent found that 4G speeds in Dublin now averaged more than 15Mbs. The survey, completed using a drive-by test of 13 different locations around the capital, found Vodafone's network to have an average 4G speed of 27Mbs, while 3 Ireland had an average 4G speed of 9Mbs. Meanwhile, the Comreg figures showed that most Irish mobile phone bills are cheaper than other EU countries. The regulator's comparison of both pre-pay and bill pay plans showed that Irish monthly costs were between 16pc and 18pc cheaper than European counterparts on average. Comreg also said a majority of Irish homes with broadband now had speeds of more than 30Mbs, while two-thirds had speeds of more than 10Mbs. However, the regulator found that a third were still without fixed-line broadband.